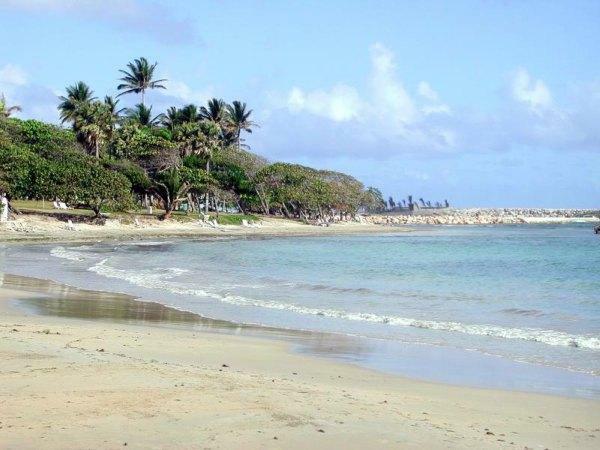 Cofresi Beach is located close to Puerto Plata and was named after an infamous Puerto Rican pirate, Captain Roberto Cofresi. This town began much like Buzios, in Rio de Janeiro, Brazil; a tiny fishing village that went on for years as a sleepy bay on the Atlantic. Today, Cofresi has changed but only slightly, with high-end hotels and condos offering great views of both Cofresi Beach and the nearby mountains. What a fantastic bay – golden sand blending into crystal clear water. There is only one entrance to the town; a narrow road that runs all the way to the beach. Mountains peak at either side of the city. Close to Cofresi Beach is the Ocean World & Water Park which houses the world’s largest dolphin lagoon. There is also a sea lion encounter claimed to be best in the world; but what some come for is the world’s first shark interaction pool. Check this out when you’re not at the beach. If you’re in Cofresi, ask anyone for directions. While here, make sure you check out the local Dominican coffee, which locals say is second only to Colombian. And the cuisine here is special as well. If you can, get a local to shop at Puerto Plata with you for the best choices at the markets. Later, experiment some of the great dishes served in this country. Culture not to be missed. Sand – golden, coral/rock content. Shade – trees along the strand, some huts/umbrellas. Notes – charming beach not likely to be overrun with tourists. This coastline boast three great beaches. Of the three, Cofresi is the most charming. You will find fun and sun here along with a myriad of water toys that can make your time away from home just that much more exciting. 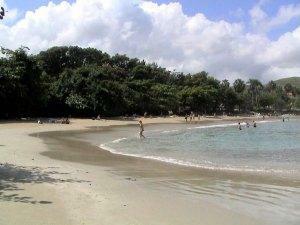 Pictures of Playa Cofresi often appear in magazine all over the world. And now you know why. Let’s start from beginning. Cofresi promise transportation from airport in beginning and when we e-mail for conformation and out flight information it was not longer available. So we have to pay for our transportation from and to airport. Bill boys are rood. They joke between each other in spannich and make a bets what you will pay for the trip. Price start at $80 and after 30 min fight drop to $10. And this is just a beginning. After our arrival we were greed by the hotel representative. He quickly sad, that we have to stay 25 min in line to check in and only after that he will talk to us. After prolong pushing and shoving he point his finger at buffet and pronounce this is the only place you could eat today. It was my birthday and he refuse to help us with reservations to any restaurant in the resorts. He dumps our bags in front of bell boy and disappear. Bell boy look at us and as quickly as hotel representative disappear as well, so we ended up going to the map with our luggage to find out place to sleep. Our room AC das not work, so we try to call front desk. Phone das not work as well. So we decided to leave our bags and go to front lobby. To my surprise door not closing as well, so we could not lock our bags in the room. All this start at 4:15 PM. After numerous trips to the office and intrusive maintenance, with single screwdriver and no other equipment in site, we ended up sleeping in this room with “Moniana” promise. Tomorrow. No rooms in the ALL Resorts were available for exchange. And this is only first day. After this “class” separation began. We could not eat in this restaurant, lie on this beach, and use these towels. Food is terrible. We discover raw sewage trenches and pipes on the beach spilling filth in the ocean. Avoid this place at any means. This is a dump with no end. Prolong and consistent jokes from the resort staff about us in Spanish and how much we have to pay and how they could make us pay by the 4 day tire us out and we could not wait to go home. Best meal on this vacation I have in the AIROPORT on the way home.